Café to Commuter to Cruiser the new 2018 Sport Glide 107 is three bikes in one! 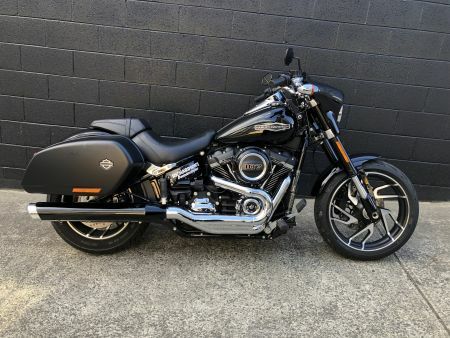 The roads may be damp and the temperatures falling but the purchase of some wet weather gear from Anna in our merchandise department has enabled me to keep powering on and continue enjoying my commute well into the colder season on the new 2018 Sport Glide 107. I’ll start by saying I love my “old school” Fat Boy®. It fits like a glove and does everything I need it to do without complaint. But this new Sport Glide, while not a Fat Boy®, turns out to be very handy piece of kit with its pannier bags, combo analogue/digital instruments and easy reach seating position. I have found the new upside down front forks handle potholes, manhole covers and other road irregularities easily (interestingly just as the 2018 Fat Bob® does). It really is worthy of a gander. The new smooth and powerful 4 valve 107 Milwaukee-Eight® engine pushes this bike through the air with little fuss. Forget to shift down a gear while negotiating a corner? Don’t worry, just twist the throttle and this bike happily powers on as easily as an automatic car would. In traffic the story is the same. A wide torque band and the slick shifting transmission makes easy work of riding home on congested streets. On the highway there is plenty of power in reserve to push you, your pillion and a weekends worth of gear in the handy panniers toward your destination with astonishing ease. This bike devours your journey having the most advanced frame yet offered on a Harley-Davidson® it is sure to please. A bright LED headlight, easily removable pannier bags and fairing for the times you want to ride cafe style and a fully adjustable mono-shock rear suspension. Can’t decide what model Harley® you want? Then this is well worth a look. Call in to our Hobart dealership and ask Jason to throw you the keys and test it for yourself. Are you ready to be surprised? Positives: Happy on all roads, commute or cruise with an abundance of power in reserve. Negatives: Is it art work like a traditional Harley®? Best check out the customising options to personalise it! Pro Tip: A pillion back rest is essential, order one when you purchase.